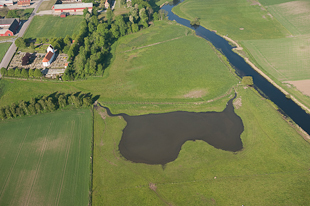 Here you will find a map with facts about the accomplished ponds and wetlands within the Kävlingeå River Project. Eutrophication, with its algal blooms, changes in fish fauna and general deterioration of water quality, has been much in focus during the past few decades. Landscape changes, starting two centuries ago, played an important role in this development. With a growing population came the expansion of towns and infrastructure as well as the intensified cultivation of farmland – all of which had a considerable effect on rivers and wetlands. The occurrence of wetlands decreased drastically, lakes were drained and many rivers and streams were deepened and straightened or led through culverts. These changes have in turn lessened the ability of the environment to reduce pollutants from the water through natural processes. In addition to this, conditions for plant and animal species dependent on wetlands have worsened, as has accessibility for those wanting to enjoy outdoor life in natural surroundings. 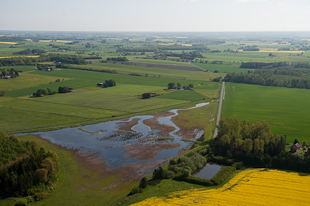 As early as in 1995, the nine municipalities situated within the watershed began cooperating in order to improve water quality in the lakes of the area and to achieve a reduction in the amount of nutrients transported by the river to the sea, Öresund. Another important aim was to improve conditions for biodiversity and outdoor life in the area. These measures were mainly directed towards building ponds and wetlands and leaving buffer zones along the watercourse. The Kävlingeå River Project had begun.